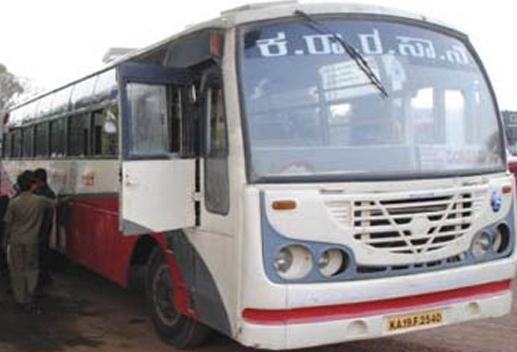 Mangaluru: July 6, 2015: The Karnataka State Road Transport Corporation (KSRTC) that had been operating about four services touching the pilgrimage centres of Sringeri and Dharmasthala via Kerekatte, a Naxal-infested region, has withdrawn the services since about 10 months. The reason offered for the withdrawal of services is lower revenue collection. While a few services were withdrawn just months after their introduction, some were in operation for more than two years helping commuters in these remote areas as well as hundreds of pilgrims. Two factors make these routes different from others. The first is these services connected two important pilgrimage centres—Sringeri and Dharmasthala—which are visited by thousands of devotees every day. In the absence of any direct bus service between these two places earlier, the pilgrims from Sringeri are forced to board buses bound to Karkala/ Mangaluru and change the bus at Bajagoli towards Guruvayanakere. Private buses operate on these two stretches. From there, they had to take a KSRTC bus to Dharmasthala. Thus, a direct bus service was much appreciated, said Balehonnur-based consumer rights activist Shankaranarayana Bhat. At the same time, the route from Sringeri to Bajagoli passes through the Kudremukh National Forest, which is infested by Naxals. Residents and students of villages en-route, Nemmar, Kerekatte etc., had the benefit of these services, though about four-five private buses too operate on this route, Mr. Bhat said. The services had enhanced connectivity to these localities thereby containing Naxal influence in the region, he added. Mr. Bhat alleged that a prominent politician from the ruling party representing the district, who is also a leading private bus company operator, has been behind the cancellation of KSRTC services. A senior KSRTC official in the Chikkamagaluru division said that the Corporation would consider reintroducing the Hosadurga-Dharmasthala and Chikkamagaluru-Udupi services during the month of August. Surprisingly, officials at KSRTC’s Puttur division, under which the Dharmasthala bus depot comes, claimed that they did not operate any service to Sringeri during the recent years. KSRTC General Manager (Operations) K.S. Vishwanath told that there were some issues with regard to permits to be obtained by regional transport authorities concerned. He said the Corporation would reintroduce the services in the interest of general public.